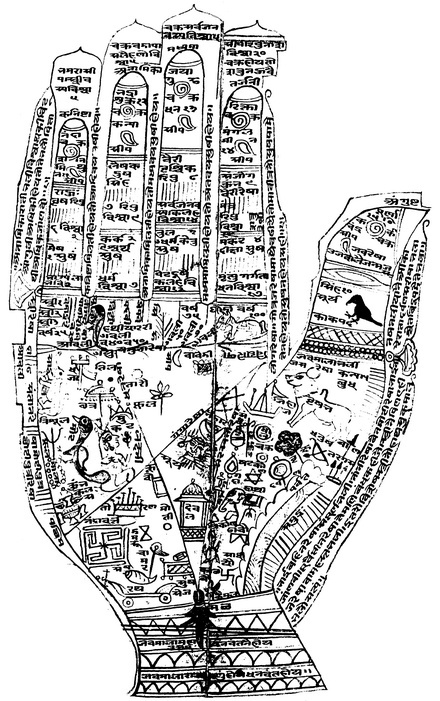 The Ancient sources and origin of astro-palmistry! Re: The Ancient sources and origin of astro-palmistry! I agree that this forum is not the appropriate medium for deeply expounding on Vedic astrology. I have a suggestion... for I think the topic that you both made comments about (the difference between Western astrology & Vedic astrology) might now directly relate to the topic of this discussion - however I do recognize that other members might be interested to hear more details about that topic. Forum VIII provides various options to discuss materials that do not directly relate to the hands, nor (Vedic) palmistry. So, you are welcome to start a new topic in for example forum section "VIIId - Serious stuff". Just a suggestion for an option to consider... and thank you both for your input in this discussion so far! In the book "Palmistry, The Art of Reading Hands" by Jean-Michel Morgan, there are several reproductions of very old illustrations that are not already uploaded in this thread. One is a German engraving from 1466 (page 9) titled "the lines of the hand as a mirror of health". The finger sections are labeled but not in English, therefore I'm unable to tell if they are zodiac related or planets. (no symbols) It also assigns Saints to the hand features. Sculptured hands may also be a source for ancient markings. Another resource is Maria Gardini's "The Secrets of the Hand" which includes on page 18 a painting of a man studying a woman's hand. 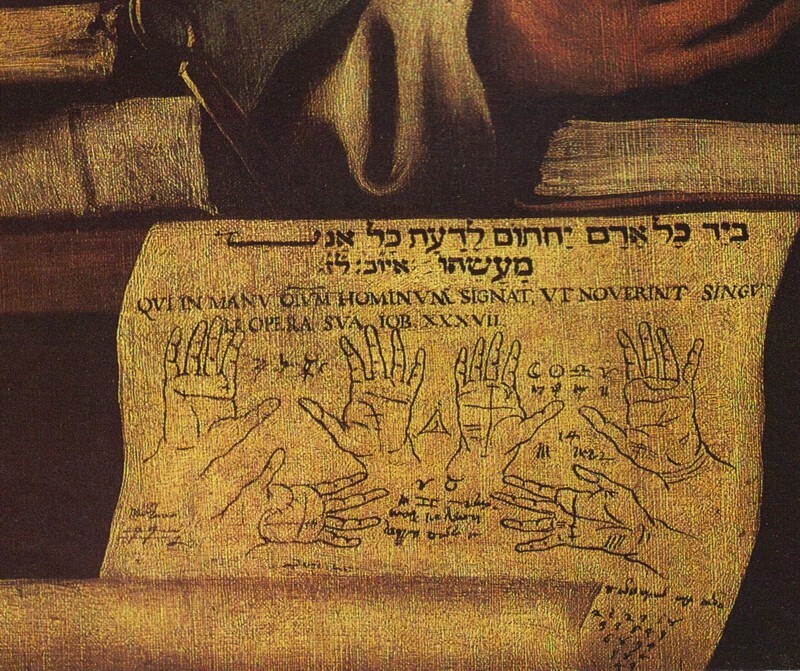 Nearby in the painting is a chart of hands including astrological symbols. The text looks to be Hebrew and another language. Painting is by Francois Xavier Pascal Fabre. The chart is said to be by Victor Alfieri. This book also contains some quality graphics of Jean-Baptiste Belot. This book and the one I mentioned previously, I really appreciate for their collection of art with hands and ancient documents. Thanks for pointing out these interesting examples. PS. Regarding the last painting: the painter is Francois Xavier Pascal Fabre (1766 - 1837), see: http://wwar.com/masters/f/fabre-francois-xavier.html . thank you for pointing to Gardini's book. It' really a nice collection. Here is a close up I just scanned from the painting. On closer look I see the Hebrew is probably the verse from Job 37:7 "He sealeth up every man's hand, so he many know his work." zaobhand wrote: You are right Patti. Thank you again, Patty, for poiting on this. I have the book of Gardini. As we see, the French (Belot and Desbarolles) used a combination of the cabbala and chiromancy. Also interesting their mention of the angels or genius'. today I found a link to get old Renaissance books on CD. The Rothmann Astro-Chiromancy book is translated from German, Saunders translated Belot. >> Dear Boas, I recommend please look for Johannes Rothmann I've mentioned in the past. Thank you for the link. Looks very interesting! 1. He used Regiomonatus houses and in general classical European astrology. - for others the new Gregorian calender!! The difference between them is 10 days. That's quite confusing if you make new birth charts for it. I've mentioned it, when I calculated them new with Regiomonatus houses and Placidus houses, which I usually use. As far mounts of hand are concern we have discussed many things in PI forum but as far astrological connection with palmistry is there I am sure it is very old in Indian palmistry in a different way. In Indian palmistry we are establishing not only 12 signs but also 28 constellations and we use them in daily practice also like to say in Horary palmistry or Mudane Palmistry or Medical Palmistry. Even we put Planets in other form for example we fixed planet Mars on index, Jupiter on middle, Venus on ring and Saturn on little fingers. Sun, Moon and Mercury are put on the Thumb. thank you for your answer, who is very interesting. I think, the assignemnt of a specific planet for a specific finger is may be only a simplified system. - Even more if using an Element for a finger. I think that we have to extend our sights if we go deeper into interpretations and if we take into conseration the aspects, houses and other important influences that colours the pure planet archetypical qualities. I think this is even much more important if we use the Zodiac. Here we are shurely still in the beginning of our research and experiences in the West. Is there any translation of your book or of any ancient, old or new Indian astro-palmistry book, that you may recommend? Thank you for the picture. - I wish I could read the letters and understand the meaning of the signs there. wow, you have done great job. I'm so much intrigued with pictorial signs on palm. Thanks for posting them. if you open new topic regarding pictorial signs on palm, it will be still more great greater. I'm expecting lot. p.s: where is bhandrariji? did he know about this website? Hope, you will suggest him about this website. From orissa, we had another expert as well. I still remember the flag sign on bhandraji's saturn mount which makes him to be genius in religious activities and occult sciences. Thank you for your prompt reply. I have not found these literature in described form even in Indian language other than Sanskrit hence I want to put all these material in front of palmistry world because it very useful as it proven in my practice and I know it should be disclosed to all. thank you for that. I'm very interested in it because there is so much to discover about astropalmistry. ps. : I you are intereste in I could make a translation of one case of study of J. Rothmann's book (around 1590 AD) inclosing the old hand drawn picture, old horoscope and my new calculations...though it would take a little time. As per my belief we have lost the key of pictorial signs of palm because we can not found them as shown in the picture. I think there must be some link between lines and signs (for say such type line/lines means elephant and such type of line/lines means lotus etc. ) I quest for this most valuable key of Indian palmistry if it possible for you to do some needful. This is my motto hence every time I say to you don’t waste your valuable time because we have to do too much work for our palmistry, culture and country. I am not worrying for your hopeless situation. Last century indian palmistry books on pictorial signs give so much hope to me. It is all depend on observation. Let we hope for and discuss about them instead of being idle. One should not be worried about my hopeless condition, I have never felt helpless or hopeless because once upon a time in 2003, when I was in frustration due to some astrological problem, my guru who is a world renowned astrologer named Shree U.K. Jha told me ‘Bhadoriya’ you have not intentionally came in this field but almighty has sent to you to do some thing so do not feel loneliness or disappointed. Almighty will show the way on which he wants to send you. Since then I feel free and performing my job effortlessly. For next topic Best of luck. May god give you the most wanted key of pictorial sign of palmistry. 'Samudrik sastra' includes detail description of all physical indication on the body. Most of the literature on Palmistry, astrology, molescopy,face reading, etc are found in pieces in Puranas, like Skanda purana, Bhavishya Purana, etc . All types of futurology come as a single large subject in our scriptures and all are interconnected to each other. I have seen various sanskrit verses showing connection between planets and molescopy, planets and palm, planets and face reading, etc. Lal-kitab which is written by SH. Roop Chand Joshi, from 1939 to 1952, is a good book on it. It is said that this book depicts the very old oral tradition of pandits. Location : Jaipur, Rajasthan, India. My simple and only one question regarding Lalkitab. Have you find similar astrology or pamistry or astropalmistry any where than Lalkitab? I think Samudrik Sastra published by Vyas Prakashan, Varanasi and 'Haath ka Angutha' by Sh late Bhoj raj dwivedi are the few book which tells some link between astrology and palmistry. I think Keralite authors where this is used widely in Nadis are still kept secret.